VIP Commission: I have invented Embroiderers Yoga. Well. This is the MOST intense amount of embroidery I’ve ever taken on and it’s the very tight deadline to get it to my finishers (as in, professional stretching and framing rather than anyone finishing my embroidery, obv) that’s the real challenge. Originally it was going to be the 12th, then it became the 3rd. Sigh. So it requires some serious hours at the coalface. I’ve written before about all the different stages it takes to complete an embroidery to professional standards, and you have seen the preparation that goes into the canvas before needle even meets thread. 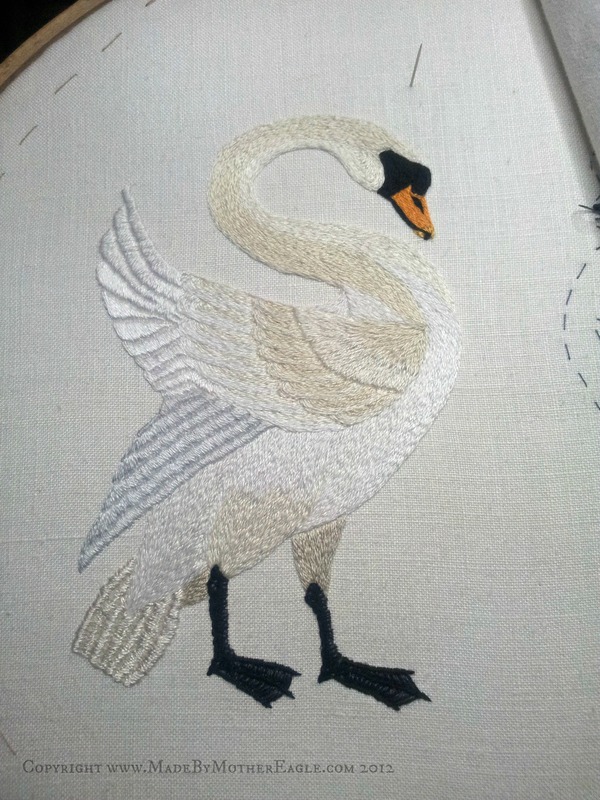 But I thought I’d write a post about what I physically do to prepare for many hours of embroidery. Like an embroidery ninja. No, seriously, it’s something I’m particularly concious of as in my other life I am a massage therapist and work with muscles and posture a lot, whilst also having my own neck, shoulder and postural issues. This week, I was doing a couple of hours in the evenings and then come Thursday afternoon I started in earnest. Friday, Saturday and Sunday I started at 9am and finished at 9pm. This kind of time does bad things to your body. Let me explain. I realise to the uninitiated the idea of sitting on ones arse for an extended time doing nothing more strenuous than passing a needle back and forth sounds hardly challenging. But repeating any kind of movement again and again can put real strain on the body. RSI sufferers will know this – typing can cause this in a similar way. Much as my stitch pit is a very comfortable arrangement designed for my needs, the neck, the thoracic spine and the shoulders, arms, wrists and hands all suffer. My schedule basically has been this past 3 days, get started at 9.30-10am until 4pm then stop for a couple hours to make and eat dinner, then start again until 9pm. I also pause regularly for snacks and cups of tea and it’s then I do my stretching: First I stretch my neck out – chin to chest, look at the ceiling, ears to shoulders. Then I basically do these stretches minus the inner thigh and hamstring ones. Plus just moving around is very helpful and relieving. 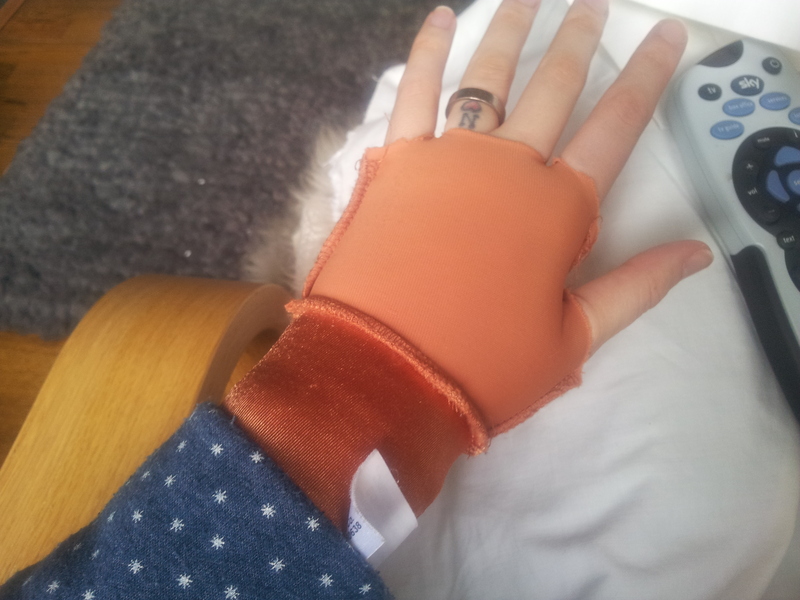 The idea is they support your wrist and hands and compress the tissues keeping them warm and circulated. Not sure how good a job they do, and I do alternate with periods of not wearng them as I find they pull my hands into a not-natural shape, but happy to use them. Then on my long 4pm break I bust out my other yoga-type moves, like Cat-Cow, and this one a chiropractor taught me, where all you do is just lie on your back with your feet up on a chair at right angles, and just hang out like that, until your lumbar spine drops out. Not literally. The deepest one is where I lie one the floor with my knees to my chest and let them drop to one side (nice spinal twist) but at the same time with arms outstretched you get a really deep stretch in the upper chest muscles; I get rounded of shoulder, and particularly when doing a big stitch sesh. Finally, I use an arnica salve on my hands and wrists, and my darling husband gives me a hand and arm massage, and maybe even a back and shoulder rub with it. This combats inflammation and is soothing for the joints and tissues. I see him as my post-embroidery physio. Here’s hoping this whole post didn’t sound like a weird overshare. Kathy at The Embroiderer’s Story has just been blogging about similar repetitive stress problems — eek! Good that you are taking care of yourself. Oo thanks for the tip I’ll check it out! glad to hear you’re looking after those arms and shoulders.